Bartleet Finance Company, a leading finance company in Sri Lanka has decided to give their support for the upliftment of tennis in Sri Lanka by sponsoring to the Junior Tennis Initiative Programme for the second consecutive year, which is organized by Sri Lanka Tennis Association (SLTA). Since 1998, the company has been involved in producing a significant number of skiled and talented tennis players across Sri Lanka.The programme will be divided under two sections, mainly Mini Tennis which is also known as Tennis 10s and Performance Tennis. 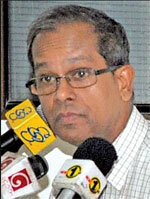 The Chairman of Bartleet Finance, Dharma Dheerasinghe said, as a national minded corporate, Bartleet Finance is keen to develop and support the growth of a popular sport such as Tennis in Sri Lanka whilst paving way for young talent to reach the pinnacle of their sporting careers as upcoming sportsmen, to represent their nation on an international platform in near future. "We believe in giving these players an opportunity to challenge themselves by competing with tennis players in their own categories, which will undoubtedly give them the confidence they need to face tougher challenges to become successful sportsmen while continuously developing their talents. We are proud to be a driving force behind the success of our nation's future generation," said Dheerasinghe. SLTA Chairman Maxwell De Silva, said that Since the inception of the Junior Tennis Initiative Programme in 1998, we have successfully groomed and produced many talented tennis players in Sri Lanka who have proceeded onto become noted performers in the sporting arena. "We are pleased to have a reputed financial institution such as Bartleet Finance on board for the second consecutive year as the official sponsor and believe that this will be a mutually beneficial and progressive partnership that will assure development in Sri Lanka tennis," Maxwell further said. The Junior Tennis initiative programme is conducted by SLTA appointed regional coordinators and supervised by an SLTA National Coordinator who monitors the entire programme. The students from Northern Province have shown their interest towards this Junior Tennis Initiative by participating in large numbers over the years.